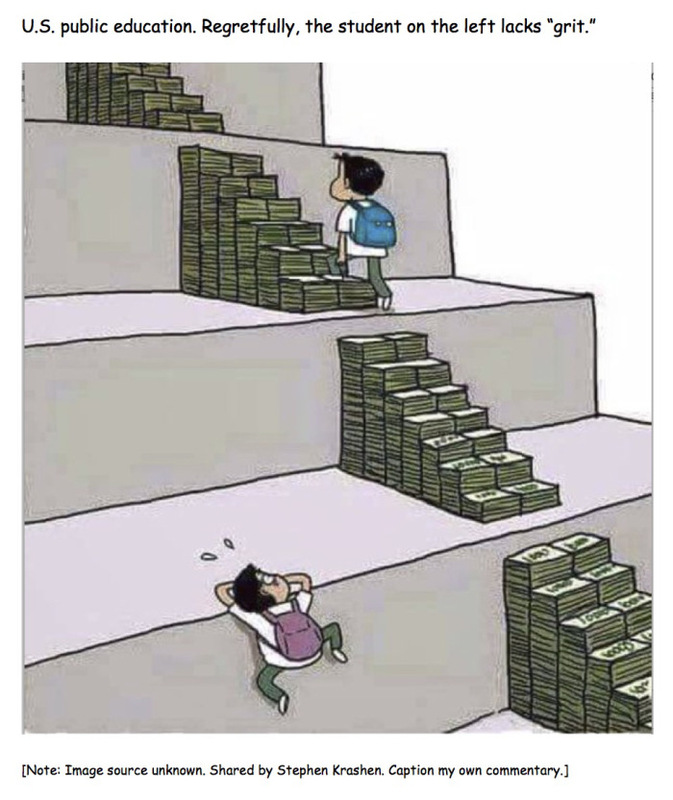 I'm guessing there are a lot of people who can connect with this genius cartoon I saw and shared at G+ this morning via Paul Thomas. I wish I could just give my needy students heaps of cash... but I'm a member of the precariate myself, not a professor. Luckily, though, I have a lot of freedom in my teaching, so what I can do is give my students the gift of SLACK. On the importance of slack, see Paul Thomas - The Poverty Trap: Slack, Not Grit, Creates Achievement. Some of the options below are very specific to the types of classes I teach (and teaching online creates a great space for slack, thank goodness), but hopefully there are some ideas here that can be useful to all kinds of teachers of all kinds of classes. 1. Eliminate punitive grading. This, in my opinion, is the best way to help reduce students' fear of making mistakes and increase their sense of freedom and confidence to experiment with their own learning. 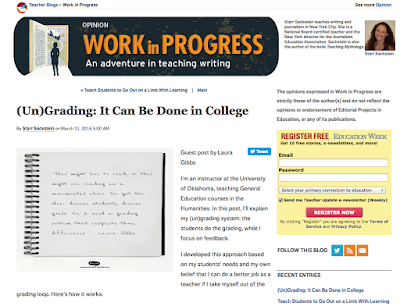 I do no grading of any kind; instead, the students do their own grading, and it is not punitive grading — it's just full credit for work completed. Details about grading here. 2. Celebrate mistakes. Instead of penalizing mistakes, build on them as opportunities for learning. Making "growth mindset" an explicit part of my classes is one of the best decisions I ever made. As a teacher, I never saw mistakes as a failure... but I realized that my students might not share that perspective. By making growth mindset an explicit part of the class, I can help students see mistakes as the road that leads to learning, rather than something to be ashamed of. More about growth mindset here. 3. Build revision into the writing. Instead of just asking students to turn in a paper at the end of the semester (leaving no room for error), I use a writing process that has lots of slack built in. Every piece of writing for the class project gets revised at least once, maybe twice, maybe even three times: it's all good! There are no negative consequences or penalties for the students who, for whatever reason, are doing a lot of revisions to their writing. More about writing projects here. 4. Eliminate quizzes and tests. Quizzes and tests are, by their nature, pretty unforgiving. Plus, they're usually not a lot of fun and not very creative. So, I've gotten rid of quizzes and tests. If you feel like you do want/need quizzes and tests, let students retake quizzes and tests after they have gotten feedback from you and had the opportunity to practice whatever they are being tested on. 5. Let students plan their own schedule. My students' lives are extremely complicated, so I make sure they can plan my class 100% around their schedule. I do ask for 6 hours per week of their time total, but if that happens to be from 1AM-4AM two nights a week, that's fine (and some students do work a schedule like that, especially if they are working an evening shift at their job). This time flexibility is one of the best aspects of teaching online, in my opinion: you can let the asynchronous model be a source of slack for your students. More about self-scheduling here. 6. Offer lots of make-up. I offer extra credit both in order to allow students to pursue their own interests, but also so that it is easy to make up any work that they miss in a given week. The extra credit is all relevant to the class and represents good learning; basically, the extra credit is a kind of "shadow class" that I would love to be teaching if the students and I had all the time in the world. Since time is limited, there is an abundance of activities classified as extra credit each week. That way, if students ever miss deadlines (as they often do), it's easy to make up the work later at their convenience. They can also use the extra credit to work ahead and finish early, which is great: that gives them some slack as they face final exams in their other classes. 7. Let students choose their reading. Each week, students choose what they are going to read, based on their own personal preferences with regard to the topic, the type of reading, the delivery format, etc. Hopefully they will make a good choice, but if they discover they don't like the reading they chose, then they should be able to do a better job the next week of choosing what to read. In addition, they can do all the reading for free online; they don't need to buy any books. Since my school already charges a $120 online course fee (penalty), I feel it is my obligation to make sure that there are no books to buy. 8. Allow for "half" reading. In my classes, I've been able to divide the reading up into two parts each week. Sure, I'd like for students to read both parts, but it's okay if they only read one part: they will be able to carry on so long as they've done half of the reading, and I definitely for them to really read just half rather than to bluff their way through the whole thing or skim without taking anything away from the experience. I'm able to offer the half-reading option because of the types of content that I teach and the highly modular nature of my course design; you can see what I mean by content divided into two halves if you look at a typical two-part unit in the MythFolklore UnTextbook. 9. Let students choose their own grade. Admittedly, most of my students want to get an A, and that's fine — but they don't "need" an A in order to learn something, and they don't "need" an A in order to make progress towards their degree. I teach Gen. Ed., and all they need to do is pass the class to get credit that counts towards graduation. So I emphasize that whether they want an A or B or C is up to them; my only goal is that they should pass the class while learning something of value to them. The A-B-C grade is just a result of the number of weeks they actively participate in the class. If for whatever reason they decide to participate less and take a grade other than A, that is fine, no questions asked... and it's really not a big deal. Plus, they can check on their progress at any given moment to know exactly where they stand. 10. Practice empathy. As someone who loves to read and write, I have to remind myself that this is not true for all my students. I also know that while I enjoy a lot of slack in my life, they might have no slack at all (some of my students work full-time, are raising young children, are managing serious medical conditions, etc.). By practicing empathy, I can try to learn about what my students need and respond to those needs if I can — but most of all I need to take the time to listen without judging, and then to help if I can. I've also made empathy part of the class; you can see how that works here: Empathy Challenges. And on that subject, here's a lovely video to watch: Brené Brown on Empathy.